GR-7 BOTTLE 125ML – 4.4 FL. OZ. New trend in hair care! GR-7 Professional is a substance that restores the natural colour and shade of the hair. t penetrates the scalp, stimulating the bulbs to produce melanin, the natural dye of hair. Liquid is used to stop greying and get a permanent effect – restore and then maintain the hair in a natural colour. 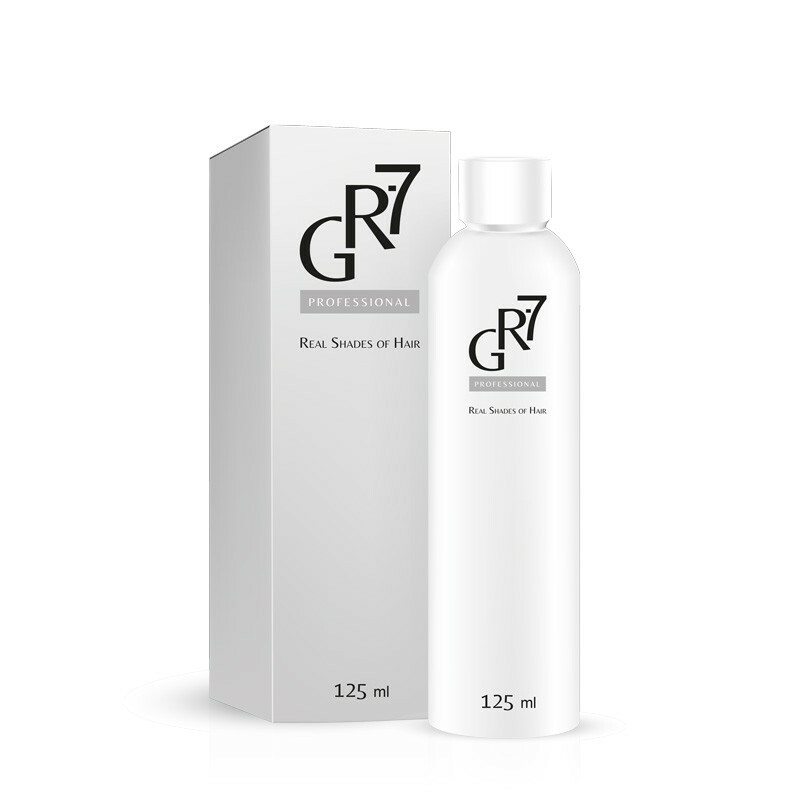 GR-7 Professional is composed of natural ingredients – burdock and horsetail extract. The liquid does not contain ammonia, the excess of which can lead to hair loss. GR-7 Professional has been recognized in Western European countries (with distributors already established in France and UK) and is an undisputed trend in hair care! GR-7 Professional is an absolute market novelty! GR-7 Professional changes the hair colour naturally, actively stimulating the hair bulbs. It is truly a revolution for your hair! Microscopic examinations made in February 2017 in the Clinical Trial of Mediestetics confirm that the patient regained his natural hair colour within first weeks of use. The attached picture shows the hair follicle along with the hair pad. The hair is healthy, in the visible phase of the anagen – the growth phase. Hair follicles and hair stems have the right thickness, and the matrix’s colour recovery process is also visible. Photos that confirmed the results were made using a microscope. The same effect has later been confirmed in consumer tests ordered by a leading European consumer product testing agency. A group of 25 testers assesed the effects of GR-7 Professional, giving it a high 4,85 mark, on a scale 1 – 5. Hair dyed with colouring shampoos or traditional dyes, are of uniform colour throughout the length of the hair. When using GR-7 Professional it is possible to obtain natural colour in different shades. The substance should be stored out of the reach and sight of children. Do not use liquid after the expiry date which is stated on the package. Store in the original package, at room temperature. Do not refrigerate or freeze as it may lose its properties at low temperatures. Keep away from children. Avoid contact with eyes. Easy to use with fast effects! GR-7 Professional should be used at least once a day (for better results, it is recommended to use it twice a day – in the morning and evening). The effects of returning to natural hair colour can usually be seen in the first 7 days of use, depending on individual. Most people experience a visual effects between day 7th and day 14th. In few cases, the process may take a couple of days longer. Before each use, shake the bottle sharply to mix the contents. Apply a few drops to the base of the gray hair and rub into the dried scalp (not in the hair). In order to intensify the effect, it is advisable not to wash your head during the first week of use of GR-7 Professional. To fix the effect after the treatment, use GR-7 at least once a week – do not dry and wash the hair immediately after application. The liquid must not be used on face, eyelash and eyebrows. If it gets into eyes, quickly wash them with water. During treatment, to make GR-7 more effective, it is recommended to: reduce the consumption of coffee, alcohol, and to refrain from smoking. The effects of GR-7 are dependent on the structure and condition of the hair. GR-7 Professional works gradually, and the changes are occurring naturally. As it is the case with most cosmetics, it is not recommended to use it for children to use it. It is not allowed to drink the liquid. It can not be combined with hair dyes or other similar substances. No animals suffered in creating GR-7.